Where do writers get their ideas – and where do Christian writers find inspiration? Reading is a basic fuel for writers and reading the Bible can be a renewable source of energy for Christian Writers. The Bible has different kinds of writing in it. There are historical books, books of poetry, proverbs, prophecy, Gospels and letters. Try selecting a type of writing in the Bible and read it daily. Read a verse or a chapter or whatever fits into your reading/writing schedule. As you read, be on the look out for inspiration and make notes in your journal. At the end of a week, or after three days, practice writing a devotional or other short piece that uses the inspiration of your reading. For added fun, try to write something in a similar style. I recently started a study of Hebrews. As I read and reflect on the verses of my study, I will practice writing letters to believers. My letters of encouragement will remind women in my church of the power of salvation and the assurance that Jesus Christ is the Messiah God promised. You might enjoy writing “proverbs” of life wisdom or the historical stories of your own life. The history of your faith journey can give testimony to the work God is doing in your life through various circumstances. When you think of writing like a Gospel writer, think about a first hand account of Jesus at work changing lives. Consider writing a poem or two that glorifies God like a Psalm and, if you are in a particularly rough space, writing the Psalms and lamentations that pour out your suffering at God’s throne can be very healing. We look forward to reading what the Holy Spirit inspires you to write when you send it in for publication on the Next Step of Faith. 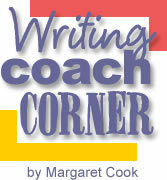 Copyright © October 2008 – Margaret Cook. All rights reserved.